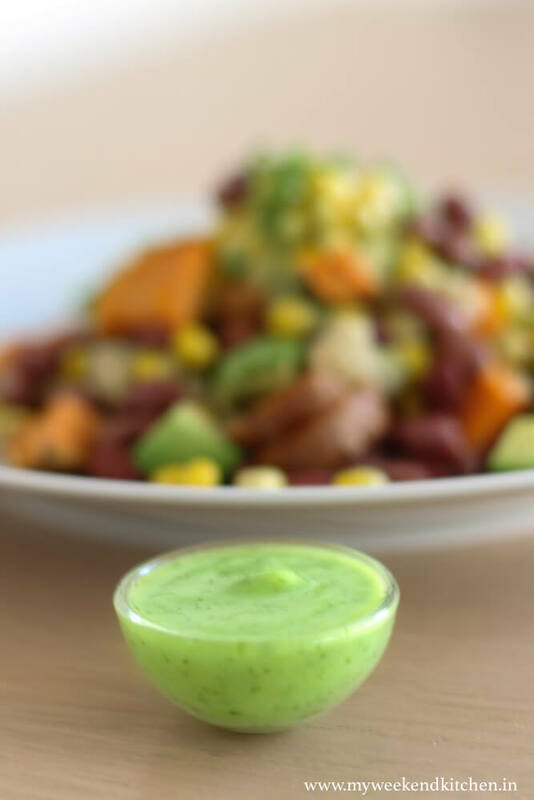 Southwestern style sweet potato salad with red kidney beans, corn, avocados, quinoa and an amazing avocado lemon dressing. I love this messy, tasty, healthy salad. I often make a complete meal of it. Traditionally a salad in India would be discs of onion, tomato and cucumber arranged in a plate with a lime wedge and a sprinkle of salt. When I started traveling, a whole new world of salad recipes opened up for me. I got introduced to the concept of tex-mex cuisine when I was living in Dallas for a year back in 2005. Being a vegetarian, a bean and veggie salad was quite often my meal choice. 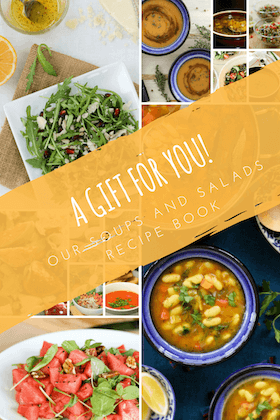 Now, more so ever, after moving towards a more dairy-free, gluten-free and plant-based diet, salads are increasingly becoming a big part of or even the whole meal. 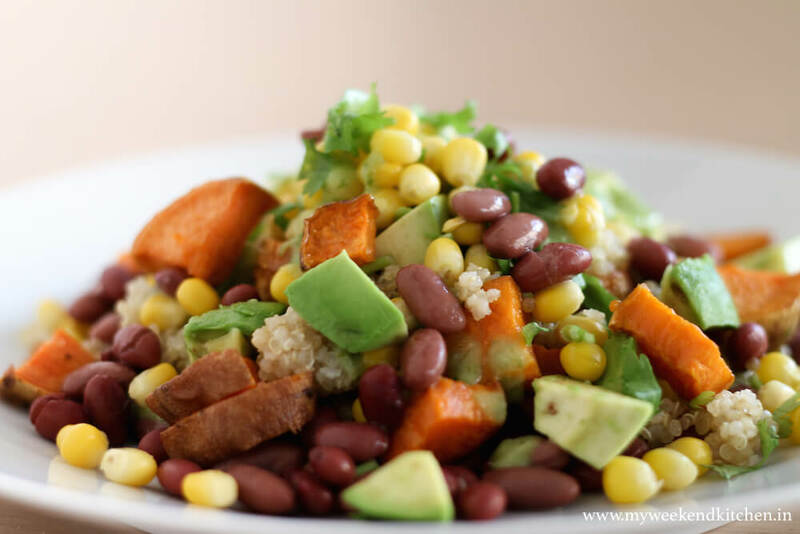 With quinoa, beans, corn, sweet potato, avocado and dressings; this Southwest Salad has all the nutrition of a full meal. It has the goodness of whole grains, vegetables and fibre and protein rich beans, everything in a fine balance. The sweet potatoes in the salad are themselves nutrition powerhouses! In fact this could very well be called a Buddha Bowl which many vegans claims is a nourishing one-bowl meal with a little bit of everything. There is hardly much cooking involved and everything can happen together. From chopping to serving, this salad is a max 30-minute recipe. Oh! and I have to give a special mention to the very simple 3-ingredient avocado dressing. It is so creamy and so yummy, I won’t be surprised if you would want to add it as a dressing to all you salads. Pre-heat oven to 200ºC. Wash and scrub the sweet potatoes well to remove any dirt. Chop into bite size pieces with their skins. The skin of the sweet potato has a lot of nutrition so avoid discarding them. Line them on a baking dish, drizzle with olive oil and sprinkle some salt. Roast for 10 mins. Remove and turn the sweet potatoes over by stirring in the dish and return to roast for another 10 mins. Meanwhile steam the corn kernels, if you are using fresh ones. In another pan, bring one cup water to boil. Wash and drain quinoa and add to the water along with a little salt. Cook till all water is absorbed and quinoa is cooked through. Halve and cut the avocados in bite size cubes. For the avocado dressing, blend together ½ an avocado with ¼ cup fresh coriander and juice of ½ lemon. Blend until it is smooth. To serve, toss together the roasted sweet potatoes with beans, corn, avocados, quinoa and fresh coriander. Drizzle some of the dressing on top and serve remaining on the side. « 6 mouthwatering snacks for a rainy day!